The financial industry meets key needs in society. It is the link between all of the economic actors when it comes to loans and credit, managing savings, making payments, offloading risk and safeguarding lives and property. High levels of expertise are essential for those who work in the industry. Standards of ethics in the distribution system are particularly important for financial institutions to fulfill their role, be taken seriously and maintain a good reputation. The reputation of the individual financial institution depends largely on high-quality customer-facing work. An understanding of ethics and the Code of Good Practice is important, but not sufficient. The rules apply to all of FinAut’s members in connection with advice, information, guidance and sales in the consumer market. The rules apply to both personal service and to digital processes. The business shall ensure that the rules are complied with. Management in particular are responsible for avoiding routines and systems, including rewards systems, that are not compatible with the rules. Advice is defined as a personal recommendation to a customer. The purpose of the rules is to ensure that the customer’s interests and needs are safeguarded in the best possible way. Customer services shall be conducted in an honest and professional manner. The framework must be clear to the customer. It shall be made clear to the customer when their preferred choice is not based on the advice provided. Personal information shall be handled in a manner that ensures the customer’s rights and privacy. Customer services shall be based on a satisfactory basis. An adequate needs analysis shall be conducted in an advisory setting. The information to the customer shall be correct, complete and not misleading. The customer’s interests shall come before those of the business and its employees. Conflicts of interest shall be identified and counteracted. If that is impossible, the customer shall be clearly informed about the conflict of interest before an agreement is entered into. The business shall do its part to enable the customer to understand the contents of the agreement and its main consequences. The customer is to be given the necessary time to consider the proposed solution before an agreement is made. An adequate needs analysis shall be conducted before a solution is advised. Solutions that are not in accordance with the customer’s interests and needs, shall be advised against. Any follow-up from both the business’ and customer’s side shall be agreed upon. The agreement and its basis shall be documented and stored. 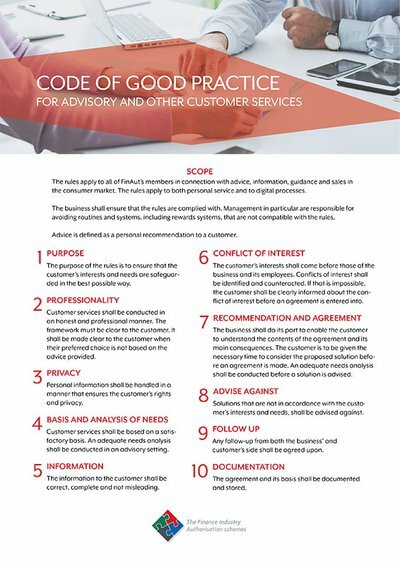 Note: in 2018, Code of Good Practiced replaced the set of rules formerly known as Good Advisory Practice.